It used to be that when one thought of airliners, it was Boeing or McDonnell/Douglas that came to mind. It seemed that everywhere you looked, these companies had a strangle hold on the industry. About 20 years ago, the Europeans felt that they could build an aircraft to compete with the American giants and Airbus Industries was born. Starting with the A.300, they got a hold in the medium range market and have since become a real challenger to Boeing for the world's airliner market. One of the more recent is the A.321. 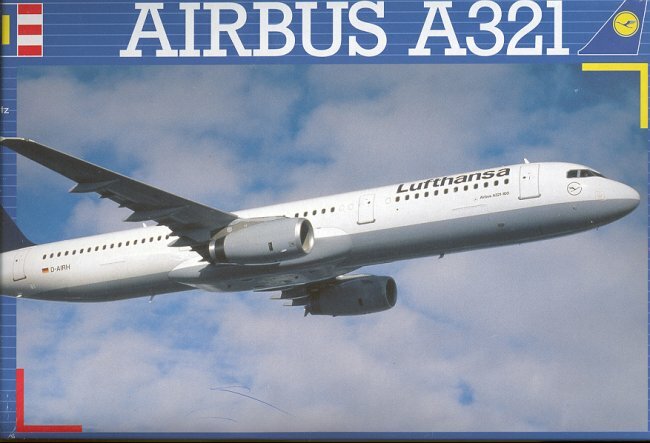 Like the A.318 and A.319, it uses the same basic wings and tail of the A.320, but has a different fuselage length. The A.321 is the longest of the series and though, like the A.320 is a short to medium range aircraft, has the ability of carrying between 185 to 220 passengers. Like the earlier Airbus airliners the A.321 has fighter-like controls consisting of a side stick control similar to the F-16 rather than the more typical center mounted control wheel. It also has a 'glass cockpit' and fly by wire controls. The version built for Lufthansa uses V 2500 engines while others can use Rolls Royce or CFM designed engines. This is the first Revell of Germany airliner that I have seen. It is a very nice looking kit and one that appears to be simple to build. You will notice from the sprues that another engine version is available, though that has not been provided for in this kit, just the V2500 engines. The kit gives options for being built gear up though there is no display stand provided. The moldings are well up to today's standards with nicely engraved detailing in the white plastic. There is only one clear part provided and that is for the cockpit windscreen. 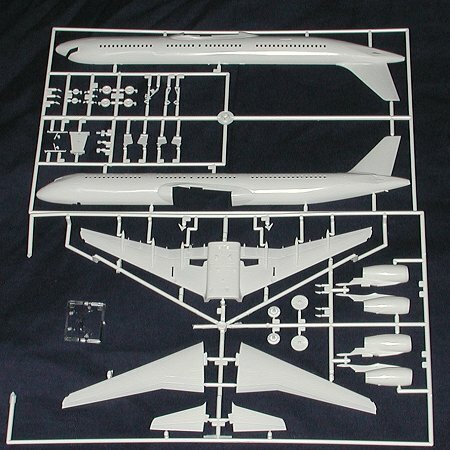 There is no interior of any kind, which is quite typical of 1/144 airliners. This brings me to a point. Most airliner modelers would prefer to have a smooth fuselage that is devoid of windows. This is because most of us use aftermarket decals and so also use window decals. In order to use those decals with this kit, the cabin windows will have to be filled and filed smooth. A rather daunting task considering not only the number of windows but that they are open. This will mean extra work. Minicraft has designed their airliners without cabin windows and that is to be applauded. I would hope that Revell takes notice of this trend and would start to produce their next new airliner kits with this in mind. 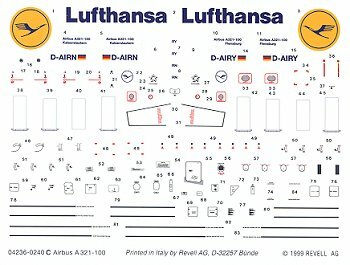 The decals are for two nearly identical Lufthansa aircraft and are quite complete. I have had mixed feelings about Revell AG's decals, but there look to be quite usable. The paint scheme is simple for an airliner consisting of only a blue tail outside of the normal grey/white airliner colors. The instruction sheet is quite complete and written in a multitude of languages. The color chart gives generic names and refers to Humbrol colors. Overall it looks like a very nice model and one that will be getting a lovely aftermarket livery! If you would like your product reviewed fairly and quickly by a site that has over 1,400 visits a day, please contact me or see other details in the Note to Contributors.